Toyo's flagship model the Trampio R1R, had been renovated to the Proxes R1R. With this remake, Toyo added more variety in size and improved the wear resistance while still keeping the grip. Let's check out the performance of the tire to see if these have what it takes to compete in the D1 series. A unique tread pattern that maintains great performance even on wet roads! The Proxes is the evolutionary tire from the Trampio line. With this remake, Toyo added more tire size varieties which the consumers were longing for and addressed the issue of a high grip tire having a short tread life. 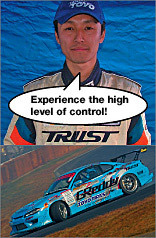 Toyo did this by still maintaining high grip characteristics of the tire. To counter weigh the problem of the tires not being stable, Toyo decreased the tread block height. The new Proxes still has the unique tread pattern named the Arrow head groove , which performs well on both dry and wet roads. Three new sizes are now available, 255/35-18, 265/35-18, and 235/40-17. These sizes cater to those emphasizing on the looks of the wheel. In the D1 Grand Prix final round, 3 competitors who use these tires have made it to the best 16, including Tatsuya Sakuma. These tires are proved to provide a very high level of performance. Let's have the semi finalist Sakuma, and Kawabata, who made it to the best 8 give us an impression of the Proxes R1R. Proxes R1R has an aggressive tread pattern with a whole new compound, adopted from the Trampio R1R. As a result, these tires still grip very well and are resistant to wear. The oversized rim lip guard emphasize that these tires were made for the streets. These tires are a bit pulled , but the rubber clearly protrudes past the rim lip. This feature can be a life saver when the rim is about to be curbed. The tread height had been decreased from the previous models. In the past, the tread height had been increased in order to lengthen tread life. The new method is to change the compound of the tires to fight tread wear. Toyo had improved the tire block flex by doing so as well. "Compared to the Trampios, the tread blocks on these have a different characteristic. Before, I noticed a slight nudge when performing the initial slide, but in this case it was a lot smoother. I can tell that Toyo changed their tire compound. Since they also changed their tread pattern, it feels like the vehicle has more grip especially while sideways. These tires provide great grip, so stopping shouldn't be a problem." 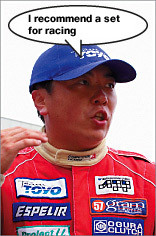 Tatsuya Sakuma "The Trampios that I used to use were front, 215-45 and rear 245-40 size. With the Proxes, I run a front 235-40 and rear 265-35. Since the there's more tread, there is definitely more grip. And also, since the tire walls are smaller now, the car moves more quicker. These are higher in terms of performance, and it enabled me to enter turns at a higher speed. These tires are also more efficient, so during sudden death matches, I can keep stepping on the gas pedal without any worries."